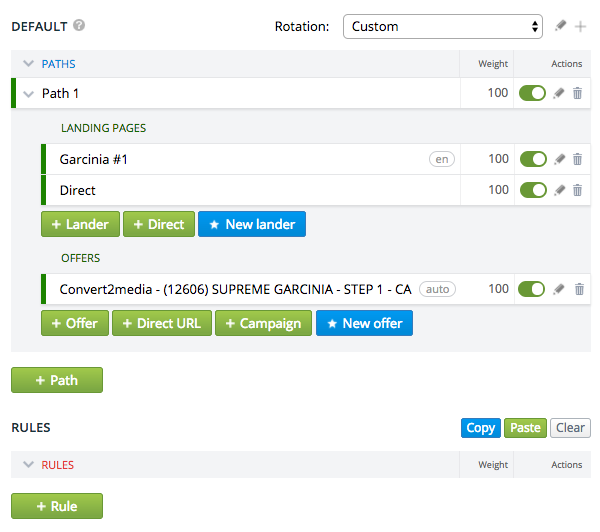 If you use a lot of campaigns with one Conversion funnel, you can use the rotations system. Create rotation and use it in several campaigns. In that case changing traffic flow settings in rotation will be applied to all campaigns with that rotation. Go to Rotations and push Create button. In the left part choose rotation name, group (if required). In rotation statistics there is a possibility to present them by specific group. In this tab you can add campaigns which will use this rotation. But be careful, when you save rotation - traffic in this campaigns will instantly start to flow by the rotations path, instead of path within the campaigns. In the right part of the page set path, lands, offers and rules just like you did it in campaign’s settings. How do I apply rotation to campaigns? 1) The first was described above. Just add campaigns to a specific rotation on the page of its settings. 2) Set the rotation from the campaign settings. Go to campaigns settings. On the right side of the pageyou have the current traffic distribution - Custom. To apply rotation to a campaign, select it in the top dropdown list (instead Custom), the distribution settings will be downloaded from the rotation to the campaign. Click Save. If later you change distribution settings in campaign, the rotation will reset back to Custom. Besides, tracker will remember the custom distribution settings, and you can always select Custom from the list of rotations.